Tighten jowls and sagging facial skin with FaceTite, a minimally-invasive procedure that delivers the same results of a mini face lift without surgery, stitches or scarring. NYC plastic surgeon Dr. Thomas Loeb is proud to offer this revolutionary treatment, which uses radiofrequency technology to rejuvenate and tone skin in just one office visit. 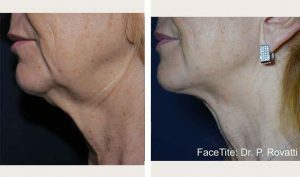 FaceTite is founded in the same groundbreaking technology used in BodyTite and promises to take years off your face and neck without discomfort or downtime. 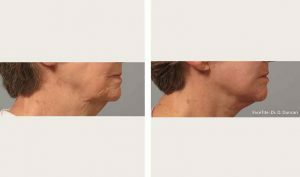 Sun exposure, smoking, genetics and the aging process can take a drastic toll on our skin – especially in the neck, jowls and face. If you’re tired of looking older than you feel, but aren’t quite ready to go under the knife, the FaceTite procedure is an excellent option. FaceTite is a completely non-surgical skin tightening procedure that utilizes targeted radiofrequency energy to tighten the skin from within the dermis. The treatment is performed under local anesthetic so the patient feels nothing as the small hand-held applicator passes radiofrequency energy through an internal electrode. There are no incisions, only tiny pin-pricks that heal within days. The entire procedure lasts no more than 40 minutes, and is proven to tighten skin instantly, though patients will see continued improvements for a period of 3-8 weeks as new collagen is formed. Check out these amazing results from FaceTite. **Images displayed above are not patients of Dr. Loeb. FaceTite is considered one of the industry’s most advanced and safest facial rejuvenating and skin contouring procedures. By avoiding the potential complications of more invasive plastic surgery requiring general anesthesia, repositioning of muscles and lengthy healing times, patients can enjoy beautiful, natural-looking results without risk. 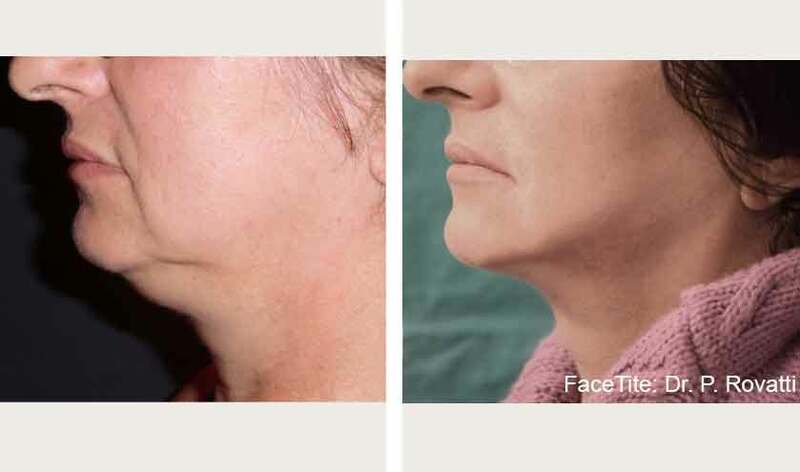 FaceTite uses the same kind of radiofrequency technology used in MRIs, Thermage and other medical treatments that have been safely performed for years. FaceTite was developed to treat delicate areas of skin without causing cellular damage to tissues, and the applicator is equipped with thermal controls to ensure safety. 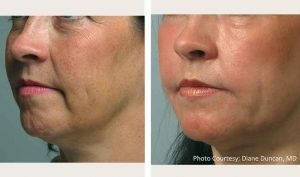 Although this novel skin tightening procedure was only introduced in 2011, FaceTite reviews have been overwhelmingly positive. Most people see a 40 percent improvement in the tightness of their skin right after the treatment, as the radiofrequency energy gives an “instant lift.” However, it’s important to note that FaceTite does not address fatty deposits around the neck or jowls, which may benefit from liposuction or BodyTite, which removes adipose cells while tightening skin. In one FaceTite trial involving 10 patients aged 45-66, cheek, jaw line and neck tightening was clinically apparent in all patients, who each reported significant improvements in skin laxity. None experienced serious complications and all patients were satisfied with the degree of tightening achieved. FaceTite can easily take 5-7 years off your appearance, and only one treatment is needed. 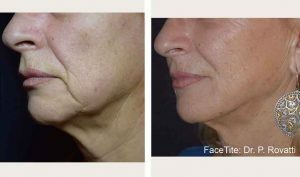 FaceTite restores and tightens loose areas of the skin, providing a toned, more youthful appearance to the cheeks, forehead, jaw line and other treated areas. Radiofrequency treatments promise the added benefit of zero discomfort, short duration and a fast recovery. Clinical studies and actual patient reports suggest that FaceTite results are equivalent to those of a mini face lift, and can last upwards of 5 years. 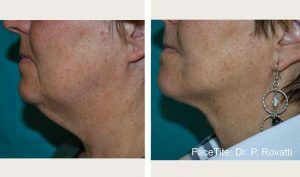 Some people who are bothered by fine lines, poor skin texture or acne scars may choose to combine FaceTite with Fractora laser resurfacing for optimal results. FaceTite prices will depend on several factors including the type and severity of the loose skin and number of areas being treated. Your surgeon’s level of training, experience as well as geographical location will also play into FaceTite treatment cost, which generally runs 30 to 50 percent less than a traditional facelift surgery. Because FaceTite is minimally invasive, using only a small needle to apply heating energy, recovery time is nominal. Expect to be tender and swollen for at least 5 days. Most patients are usually back to work within 7-10 days. Prior to the treatment, Dr. Loeb and his staff will outline all necessary precautions, but most patients can resume normal activities within a few days of the procedure. Yes, swelling is a common side effect of FaceTite – partly attributed to the lidocaine injections used to numb the face– and normally lasts for 7 days. Inflammation will subside on its own, and may be accompanied by redness and bruising. Is there a risk of FaceTite nerve damage? FaceTite is a sub-dermal procedure that carries a very small risk for nerve damage, though this complication has not been reported. This possibility is greatly reduced when FaceTite is performed by an experienced surgeon that uses the correct technique. Patients may experience mild numbness if the nerves are bruised, but this resolves spontaneously over a period of one month. In more aggressive FaceTite procedures, numbness may take 6-8 weeks to completely subside. Dr. Thomas Loeb is a board certified plastic surgeon who specializes in facial rejuvenation using state-of-the-art technology. If you have any questions regarding FaceTite skin tightening, or would like to schedule an appointment, please call 212-327-3700.